Full cancellation with 10 days or more notice prior to arrival date incurs no penalty. Full cancellation with less then 10 days notice prior to arrival incurs 100% penalty charge. Reduction in numbers with 48hrs or more notice prior to arrival date incurs no penalty. Reduction in numbers with less then 48hrs notice prior to arrival date incurs 100% penalty charge. There is a 50kn per person key deposit that is charged upon check in. This amount is refunded upon check out when the key is returned. 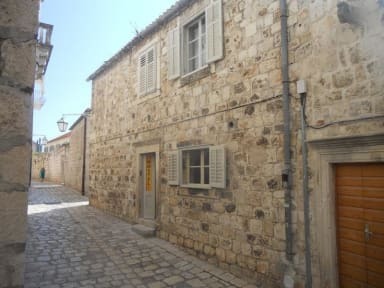 Hvar Island voted as one of The Most Popular Europe Summer Holiday Spots In 2010 by lonley planet"
'Hvar Out' is what you'll say when you see the location of this hostel! Our brand new fully renovated hostel opens its doors this summer (2011) and we boast the BEST LOCATION of All Hostels In Hvar. You can't get much better than this - we are literally a stones throw away from the famous Carpe Diem night club and also the catamaran. Located on the main promenade along with all the popular beaches,bars and clubs that Hvar is famous for, we are IDEAL for a quick stumble home after a long night out. Your stay will never be boring with so many things to do on Hvar! From scooter rental, island excursions, fishing trips to a Full Moon Party, our awesome staff will provide you with everything you need to know for the ultimate Hvar Out experience.Hvar Out is owned by travelers and run by travelers (all of whom speak English). Use of our fully equipped kitchen. El hostal está bien ubicado, las habitaciones y baños estaban limpios y tiene buen ambiente. Muy bueno todo! Super recomendable!! It was an excellent stay in Hvar. the hostel well located, very good vibes with the people who work at the hostel. I recommend it!! Todo estuvo muy bien, una buena opción para alojarse en Hvar. We had a great stay in this hostel. It is the typical seedy (with care) hostel painted in colours and with deep sentences on the walls with an incredibly nice staff and great atmosphere to meet other people. Nice terrace and great location. Would definately repeat! A destacar los chicos de la recepción, siempre muy predispuestos a ayudar. La higiene en los baños esta bien, en las habitaciones al ser hostel siempre depende del resto de los viajeros y en este caso, la gente con que compartia eran muy sucios. En cuanto a la seguridad diria que es nula. Las puertas de las habitaciones tienen llave comun y nadie suele cerrar. Ademas cualquier persona puede entrar a ellas, de hecho una noche una persona ajena al hostel durmio como invitada de un huesped.